The duality of the destructive and healing properties of water flows over the characters in this captivating novel, both cleansing and destroying lives across generations. Simon Watson’s life is literally and figuratively falling apart. His house on the edge of the ocean is a wreck, he lost his job, and he’s uncovering dark secrets about his long dead parents. When a mysterious bookseller sends him a traveling carnival log from the 1700’s, he begins to piece together the puzzle that is his family legacy. His mother, grandmother and great-grandmother - themselves carnival acts - drowned themselves on the same day, generations apart. That same day, only weeks away, causes Simon to fear that his increasingly disturbed sister will be next. Mermaids, mute boys, magic, fortunetellers and curses weave a colorful saga of desire and deceit that spans hundreds of years. One June day, an old book arrives on Simon's doorstep, sent by an antiquarian bookseller who purchased it on speculation. Fragile and water damaged, the book is a log from the owner of a traveling carnival in the 1700s, who reports strange and magical things, including the drowning death of a circus mermaid. Since then, generations of "mermaids" in Simon's family have drowned--always on July 24, which is only weeks away. As his friend Alice looks on with alarm, Simon becomes increasingly worried about his sister. Could there be a curse on Simon's family? What does it have to do with the book, and can he get to the heart of the mystery in time to save Enola? 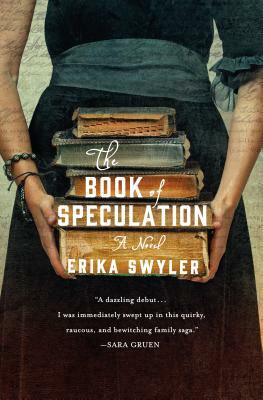 In the tradition of Sara Gruen's Water for Elephants, Erin Morgenstern's The Night Circus, and Elizabeth Kostova's The Historian, The Book of Speculation--with two-color illustrations by the author--is Erika Swyler's moving debut novel about the power of books, family, and magic. ERIKA SWYLER is a graduate of New York University. Her short fiction has appeared in WomenArts Quarterly Journal, Litro, Anderbo.com, and elsewhere. Her writing is featured in the anthology Colonial Comics, and her work as a playwright has received note from the Jane Chambers Award. Born and raised on Long Island's North Shore, Erika learned to swim before she could walk, and happily spent all her money at traveling carnivals. She blogs and has a baking Tumblr with a following of 60,000. Erika recently moved from Brooklyn back to her hometown, which inspired the setting of the book. The Book of Speculation is her debut novel.